The autosampler allows for up to sixteen samples to be run in sequence with minimal operator supervision. Confirmatory VOCs Monitoring requires method detection limits in the lower parts per billion volume (ppbv) range. This type of analysis requires preconcentration of a given volume of ambient air into a much smaller volume prior to introduction into the GC column. 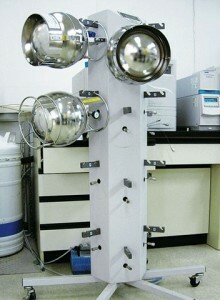 In order to maintain performance of the mass analyzer, most of the water vapor and carbon dioxide present in the air sample must be removed prior to analysis. 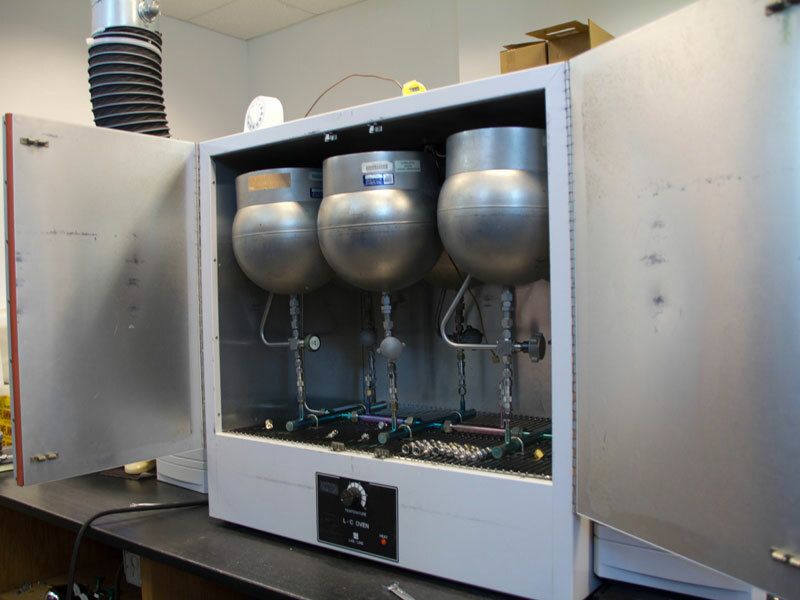 The Entech 7100 Preconcentrator performs these tasks automatically by flowing the sample through threeconsecutive cryogenic traps at different controlled temperatures. This results in very low detection limits not obtainable without cryogenic preconcentration. 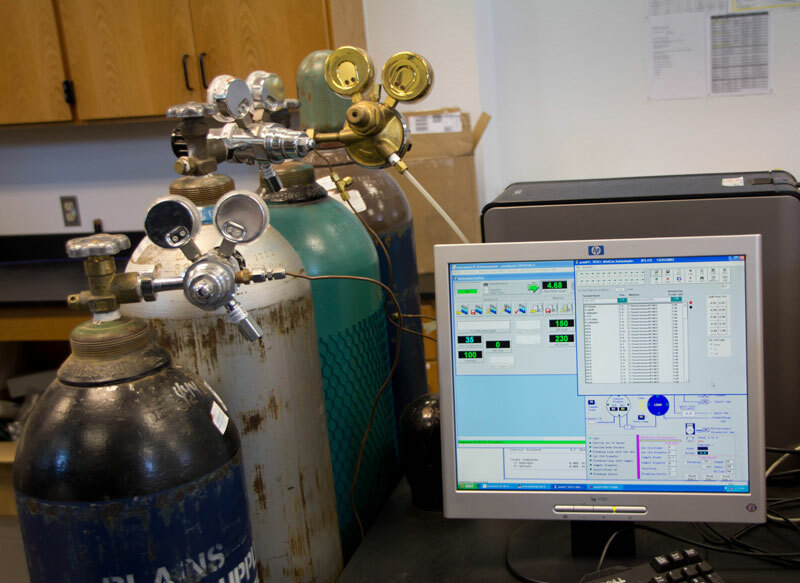 Stock cylinders of Calibration Standard and Laboratory Control Sample gases are purchased certified from a reputable supplier, and then diluted to working concentrations with Ultra- High Purity (UHP) Nitrogen using the Entech 4600 Dynamic Diluter. Canisters are cleaned after sample analysis using the Entech 3100 Canister Cleaning system, which consists of a computerized control module with vacuum pumps and an oven containing a passivated manifold with fittings for connection of canisters. The control software initiates the cleaning of canisters by heating coupled with multiple pressurization/evacuation cycles. A blank sample is analyzed from each cleaning batch as a control to assure proper cleaning has been achieved. Analyses for Volatile Organic Compound Monitoring were conducted under procedures using concepts of EPA Method TO-15 “Determination of Volatile Organic Compounds (VOCs) in Air Collected in Specially–Prepared Canisters and Analyzed by Gas Chromatography/Mass Spectrometry (GC/MS)” (1999).Special quality assurance requirements for these activities were detailed in the “Quality Assurance Project Plan for Volatile Organic Compound Monitoring”, prepared by WTS. CEMRC personnel wrote procedures for this project under the CEMRC Quality Assurance Plan, which were verified, validated, and placed in the CEMRC Document Control Program. Procedures were composed to include QA requirements from EPA Method TO-15 and all WIPP documents relevant to the Confirmatory Monitoring Program. See Table 4-2 for a list of CEMRC Procedures for Confirmatory Monitoring. In November 2006, a WIPP permit modification incorporated an expansion of sampling in the Volatile Organic Compounds Monitoring Program. Originally, the samples were collected from only two stations in the WIPP underground (VOC-A and VOC-B). The permit change requires sampling from closed rooms within the current panel until the entire panel is full. Therefore, Attachment N now refers to both Repository VOCs Monitoring and Disposal Room Monitoring. The required detection limits for different types of samples are summarized here.